No One Is Illegal – Vancouver » Blog Archive » Miraculous holiday news – Nader Released from Detention After Six Years! Miraculous holiday news – Nader Released from Detention After Six Years! We are thrilled to be able to share the news with you that Nader has beenÂ released from detention and his Pre-Removal Risk Assessment has been accepted! Nader is a 46 year old Iranian refugee who had been detained and imprisoned by Canadian Border Services Agency since 2005. Nader spent over SIX years behind bars, without any substantive charges, under the jurisdiction of the Immigration Act. His length of detention has been unprecedented in Canada and Nader had been on a seven-week hunger strike to protest his ongoing, essentially indefinite detention. Given the length of time that Nader was in detention, we know that his release was a direct result of the community organizing and pressure that was slowly building around this situation over the past six weeks. (We even received correspondence from the Immigration and Refugee Board Communications Department about it.) His PRRA was accepted literally within days of it being filed and Nader was quickly released from behind bars in order to avoid further public scrutiny of this cruel, inhumane, and unjust incarceration. We are inspired by the courage and steadfastness of Nader, who reached out and spoke out despite the fear of further punishment behind bars. Despite a system that silences refugees and forces migrants to remain subservient, we know that when we fight together we can break these chains. 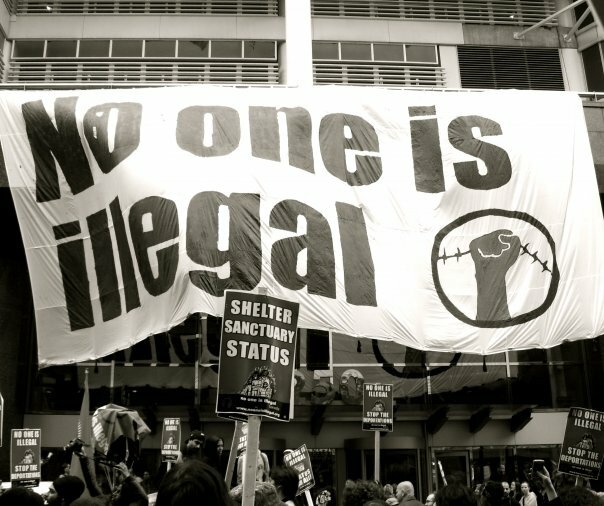 In the context of increasing detentions and deportations facilitating prison expansion and a government that insists on treating racialized migrants as expendable commodities, we re-affirm dignity and self-determination in the movement for migrant justice. We look forward to rising together in yet another year of struggle and liberation as we strive for the right to remain, the freedom to move, and the right to return. The ongoing apartheid reality instituted through reserves and sweatshops is one that must be fundamentally uprooted and transformed. We envision a humanity where everyone has the right to sustenance and the ability to provide it, where we are free of oppression, misery, and exploitation, and are able to live meaningfully in relationship to one another and in reverence for Mother Earth that sustains us. Nader is a 46 year old Iranian refugee who has been detained and imprisoned by Canadian Border Services Agency since 2005. Nader has spent over six years behind bars, without any substantive charges, under the jurisdiction of the Immigration Act. His length of detention is unprecedented in Canada. Nader arrived to Canada from Iran with his wife and young son in 1997 as political refugees. At the time they made a claim based on her persecution in Iran as a dissident. The familyâ€™s claim was initially rejected by the Immigration and Refugee Board in 2000 and shortly after Nader and his wife separated. His (now ex) wife and son subsequently were granted legal status but Nader was ordered removed from Canada. The unjust and cruel rationale provided for his ongoing detention by the Immigration and Refugee Board is simply the fact that he refuses to sign documents for his own deportation to Iran. Canadian Border Services have argued for ongoing (essentially infinite) detention because Nader is deemed to be â€œnon cooperative in signing documentsâ€. They want him to sign a document which states he is returning â€˜voluntarilyâ€™, absolving Canada of its complicity in his involuntary removal and using detention to pressure him to lie about his own deportation! For six years Nader has been incarcerated at Fraser Regional Correctional Centre, a maximum security provincial facility. This facility is mandated for short-term offenders whose sentence does not exceed two years. Short term facilities such as FRCC lack the infrastructure and resources to house and accommodate long-term inmates. Nader has reported that he has been subjected to a poor diet and lack of quality health care at FRCC. Without internet and law library materials (which are available at other federal facilities), he has been unable to defend and advocate for himself. Nader continues to face risk in Iran â€“ a similar risk to what his (now ex) wife and son were granted asylum for in Canada. Nader has never even had a refugee claim heard on the basis of his own experience in Iran and fear of persecution if deported back to Iran. Nader has recently filed a Pre Removal Risk Assessment and will be pursuing other legal avenues given the trauma he has suffered in Iran and now in Canada.